One of LA’s best-kept secrets and a favorite with its substantial loyal audience, Music & Conversations will present its next concert of chamber music with the Lyris Quartet on Saturday, Nov. 12, at Jack Rutberg Fine Arts. Listeners should plan to arrive at 7 p.m. for wine courtesy of Casa Torelli Imports/Deluca Trattoria, and to experience Jack Rutberg’s latest exhibition of exceptional art, as well as the conversations for which these concerts are known. The one-hour performance, without intermission, begins at 8 p.m. 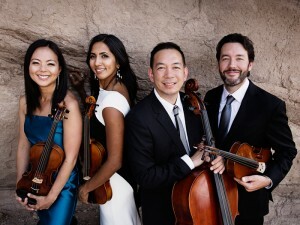 The Lyris Quartet — violinists Alyssa Park and Shalini Vijayan, violist Luke Maurer and cellist Timothy Loo — recently released a CD, “Intimate Letters” (reviewed by Culture Spot). Included on that disc is Billy Childs’ Unrequited — commissioned by Lyris and inspired by Leoš Janáček’s String Quartet No. 2, “Intimate Letters” — which will be performed at this event. Childs will be in attendance to introduce his piece. Dmitri Shostakovich: String Quartet No. 8 in C.
Jack Rutberg Fine Arts is located at 357 N. La Brea Ave., LA 90036. All tickets are $20 (includes wine reception), available at www.musicandconversations.org or may be purchased at the door. Advance ticket purchase recommended, as seating is extremely limited. Free parking.